HOW DO I USE THIS? My third grade colleagues and I create simple sentences based off of our weekly (or bi-weekly) patterns. Each sentence usually contains two words following the spelling pattern we taught earlier in the week. We grade the spelling pattern words ONLY and plug that into the score (usually the score is out of six). If we are able to assess the grammar lesson, we usually try to plug that into the sentences too. For example, if grammar was common versus proper nouns, we will use both within the sentences, however, we leave notes about grammar at the bottom and we do not plug it into the final score at the top. WHY DO SENTENCES? 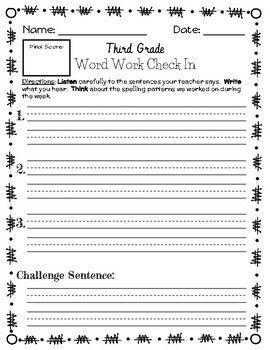 Sending home spelling lists promotes memorization, it is not truly assessing whether the student can apply the spelling pattern independently and in writing. If a particular lesson has several spelling patterns (long i in Journeys has -igh, closed syllable /i/, and -ie), we make sure to include words with each type. NOTE: If the spelling pattern is a particularly difficult one, or if students show difficulty with learning the pattern during the week, the lesson may be extended into a second week. Additional instruction and practice may be given.